Stuck in a dull job and still living with his parents, Jon (Domhnall Gleeson) is desperate for change. He wants to be a songwriter and musician but can’t seem to create anything original. When Jon joins an avant-garde pop band, led by the mysterious and enigmatic Frank (Michael Fassbender), who hides his face behind a huge fake head, he believes he is finally about to make it big. However, Jon soon finds that he is out of his depth and terrorised by bandmate Clara (Maggie Gyllenhaal). Do see it whenever you have the chance - it is eccentric, laugh out loud funny and really very poignant. The cast are all superb. Gleeson portrays Jon’s journey beautifully. He pins all his hopes for success on this quirky band - despite all evidence pointing to disaster. Meanwhile, Gyllenhaal is brilliantly scary and unpredictable. And then you have Michael Fassbender whose face you hardly see and yet who manages to convey the most complex, tortured emotions. There are few films that manage to be both funny and affecting in such an enjoyable way as Frank. The humour is perfectly played. You are never asked to laugh at the offbeat characters - many of whom we discover are struggling with mental and emotional issues. These issues are dealt with sensitively and seriously. Instead, you laugh at the absurdity of Jon and how blinkered he becomes to the reality of his situation. 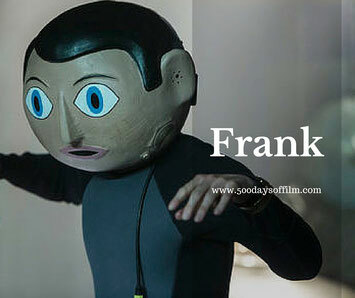 Frank is a wonderfully weird, funny and, ultimately moving film - a movie I would highly recommend. Lenny Abrahamson is fast becoming one of my favourite directors and I am looking forward to watching some of his other films very soon. Click here for my review of Lenny Abrahamson's Room. Frank was written by Jon Ronson and Peter Straughan (Tinker Tailor Soldier Spy) and is based on the memoir by Jon Ronson. The film’s fictional story is loosely inspired by Frank Sidebottom, the persona of cult musician and comedian Chris Sievey, as well as other musicians like Daniel Johnston and Captain Beefheart. Have you seen Frank? If you have, what did you think of this film? I would love to know… do leave me your thoughts in the comments box below! Oh wow, we just watched this after seeing it on your Netflix Gems list - absolutely brilliant! Good call! Definitely want to see more of this director's work. And how great is Fassbender?! Hi Sophie, I am so glad that you enjoyed this film. I loved it too and agree that Lenny Abrahamson is a brilliant director. I was just blown away by his latest film, Room. Fassbender is such a superb and versatile actor isn't he... is there a role he can't ace?